Today I’m diving into one of the big mindset roadblocks we face as negotiators – the fear of asking for something because we’ll look difficult. If you’ve ever backed down from going after something because you didn’t want to be labeled high maintenance or pushy…this one’s for you. Whether or not you self-identify as a people pleaser, not wanting to rock the boat or make a nuisance of yourself is a pretty common characteristic. And for the smooth functioning of society, I think it’s good that most of us have some of that reserve in how we behave. The problem arises when we stop ourselves from asking for something we want, need or deserve because of that high level of self-monitoring. That’s when we get stuck. So to get us over that hurdle and heading straight for what we’ve set our sights on, let’s focus on HOW we’re asking. #3. Match risk with request. Would you prefer that a document you’re signing be in Times New Roman instead of Comic Sans? I think most of us would. But making that one of your asks of a vendor or client may be a mis-match of risk and request. If the content is good, the fee is right and you’re keen to work with them…let the font go. It’s a low risk or no risk item. It’s ok to not ask for this one. Your challenge this week is to use these 3 tips when those worried or anxious feelings come up when you're getting ready to make the ask. 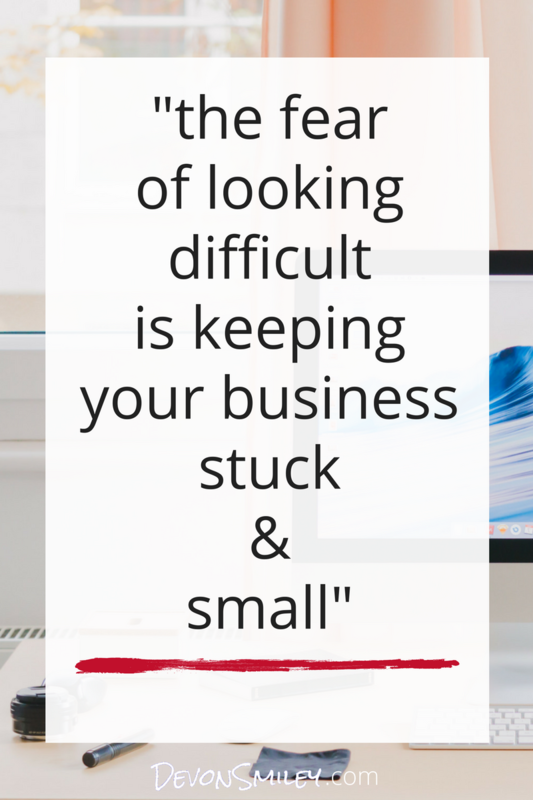 Do you shy away from asking for what you need because you're worried you'll look difficult? Let me know how you conquer that fear, or which of these tips has helped you in the comments below.